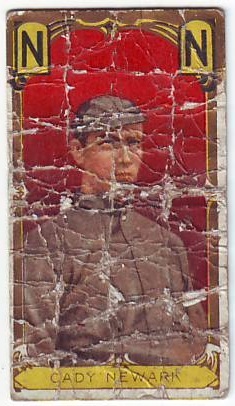 It's been a while since I purchased a poor old baseball card. While surfing eBay earlier in the week, this T205 caught my eye. It had all the characteristics I look for: Creases, folds, old and somewhat rare. So I bit the bullet and bought this for about $15. I know it seems like too much for a total beater but this card had one thing going for it that made it worthwhile: it's of a minor leaguer. There are only 12 minor league cards in the T205 set. They are not only rarer than your typical T205 card, they also demand a premium. Shown here as a member of the Eastern League's Newark Indians, Hick Cady eventually moved on to become a backup catcher with the Boston Red Sox where he was a member of three World Championship teams (1912, 15-16).